Book now the best shore excursions in Mahon. High quality and safety at the lowest prices. If your are looking for the best Shore Excursions Mahon, book now the best guided tours at lowest price with Ancora Tours. Since 2003 we offer you official guides in english, transportation and travel insurance, all included. The highest quality at the lowest rates. 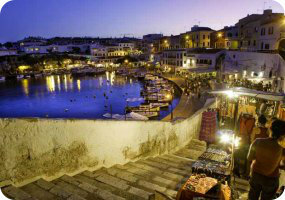 Although just a small island, Menorca often captured the attention of the most powerful empires throughout history and was governed by Roman, Moor, British, French and of course Spanish rule. If you’re visiting Spain for the first time as part of this shore excursion in Mahon, be warned, this is an addictive country, you won’t be able to wait to return! What’s eating: Be sure to sample as many different types of tapas as possible. Souvenir: There’s plenty of choice but you can’t go wrong with a classic Spanish fan. This shore excursion journeys through the city of Mahon, one of the largest natural harbours in Europe. Its strategic location in the centre of the Mediterranean Sea historically made this port an important gateway used by many civilizations. We’ll make a quick stop in the town of Torralba to see the archeological remains from the prehistoric age. Next, we continue to Monte Toro, the highest point of the island to enjoy some great views of the landscape. On a clear day, you can see the whole of the island, including Ciutadella which is the next stop of our Mahon shore excursion. Ciutadella was the old capital of the island, before British occupiers made Mahon the capital. Ciutadella is now considered the religious centre of the island and is home to the Cathedral of Menorca. This Gothic/Neoclassical structure was built in the 14th century by King Alfonso III. We’ll also see the Church and Convent of Santa Clara before concluding the shore excursion and returning to port.